How is it July already? What happened to June? The fact that it's July gives me mixed feelings. It's well and truly summer now and I love summer. The school holidays are just three weeks away and I have been looking forward to these summer holidays since last summer. Last summer was seriously such a fantastic time. But there is a part of my that is sad that it's nearly the summer holidays because that means my daughter's time in reception is nearly over. It's been such a great school year and I am sad to see it over. I am also feeling the pressure to make sure that this summer is as absolutely fabulous as last summer was. I know I am probably just being silly. 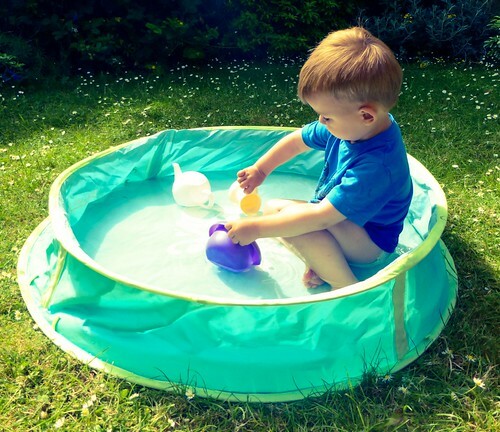 After all kids are pretty happy just spending the summer in a paddling pool (see photo above of my son) but I really, really want my children to have such amazing summer memories. Let's keep our fingers crossed for lots of lovely warm sunny days which I can fill with summer adventures and ice cream!